An understated, haunting country rock track with plenty of replay value. This post is in association with pushpowerpromo.com. For more details see the bottom of the post. The melancholic instrumentation is understated but pleasing throughout; the introductions to both the first and second verses are especially nice. The guitar melody is very catchy. There are plenty of evocative and quotable lyrics here and Ben's delivery is heartfelt and memorable. I am not 100 per cent taken with the refrain ('all I know, know') although I am not entirely sure why. Also the ending feels a tad abrupt. I would have loved to hear Ben and band let loose with a big, raucous climax. However, I can appreciate that doing so may have been too far removed from the understated feel of the rest of the track. Even with these slight quibbles I enjoyed Ben's words and performance. I'll be sure to revisit this track and follow the band's progress with great interest. I very much liked the mix. There's a great balance between both the instruments themselves and between the instruments and the vocals. I would be tempted to perhaps have just the absolute tiniest more high end but again, I can totally appreciate that this could spoil the warm, earthy vibe of the track. 'Nashville Calling' brings to mind such legends as Pearl Jam, Tracy Chapman and Live. I very much like the track and I have focused on the few elements that I may - emphasis on may - tweak in the name of 'tough love'. Nothing I say takes away from the good to very good impression I get of the band from this track. I'll be sure to revisit this track and follow the band's progress with great interest. Guys, you have a new follower in me. 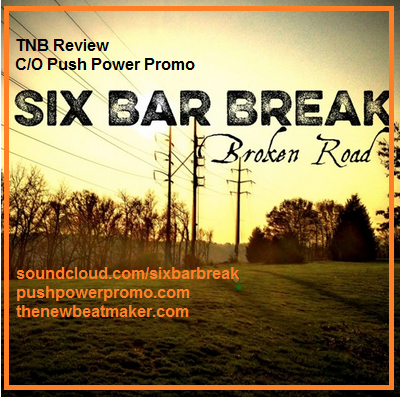 I have been paid to review Six Bar Break 'Nashville Calling' by Push Power Promo.